In a couple of months time I will be 21. This is clearly an important time in one’s life, in my case particularly as I will also be undertaking the purchase of my first bespoke suit. As a regular reader of your blog I’m seeking your advice as to specification. All being well I will graduate and be gainfully employed soon, and so a suit will probably be a day-to-day requirement. My feeling is that a dark blue three-piece suit, perhaps with some detail in the cloth (pencil stripe or faint check) for a little personality, is the way to go. The suit will, as you have often said, require a suitable pair of shoes (hoping my Grandma will understand this, fingers crossed). I’m thinking dark brown, maybe John Lobb City II (below). What do you think of these ideas and what would you do in my position. Lastly where would you go to get a first suit made, at the moment I’m thinking Thom Sweeney (shown top) or perhaps Mark Powell? 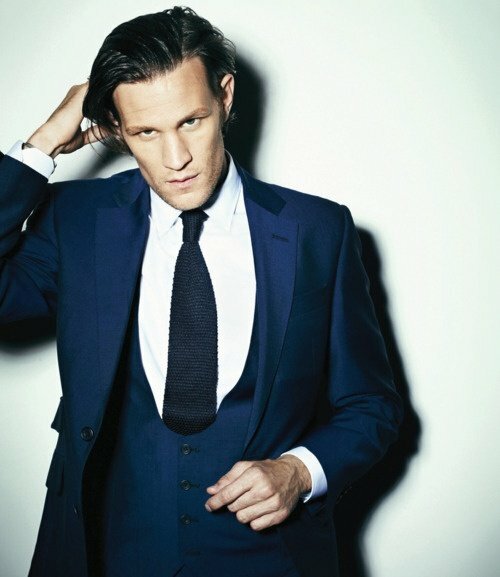 A navy suit is certainly the best place to start. Although mid-grey probably suits more people (in terms of skin tone) navy is the most versatile. It will suit any office, can be dressed up or down, and in the former case can even double as a form of evening wear. I would err away from a three-piece though, unless it is something you have your heart set on. It will add substantially to the cost of the suit and is unlikely to get that much wear. Perhaps ask the tailor to order a waistcoat-length of the cloth, so that you can always have it made later. Pleased to hear you’re getting a good pair of shoes too; it makes all the difference. 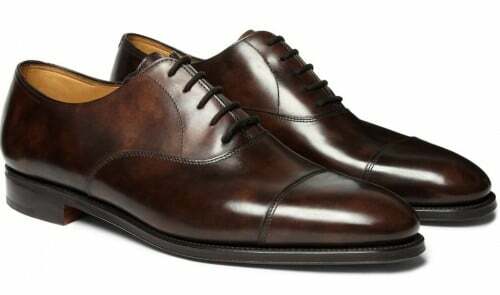 John Lobb is a great make, though I prefer Edward Green at that price range personally. I’m also not a great fan of the artificial look of the Museum Calf on those Lobb models. As to colour, black is a safer choice but of course it depends a lot on your potential work environment. If you’re hoping to be a lawyer, I’d certainly start with black. Brown will be more versatile. Stick to classic material and cut, with nothing extravagant. A nice 11- or 13-ounce worsted, perhaps with a little surface interest, as you say. Two button, or three-roll-two, two vents, no pleats, no turn-ups etc. As to tailors, that’s a very big question. Thom Sweeney and Mark Powell both have distinctive looks, and if that’s what you want, go for it. Three I would recommend for value, covering the biggest three cutting styles are Kent Haste & Lachter (classic English, Huntsman-like), Steven Hitchcock (drape cut, Anderson & Sheppard-like) and Solito (Neapolitan). I hope that helps. Any other questions please feel free to add them in the comments to this post. You can follow the discussion on How to buy my first bespoke suit – reader question by entering your email address in the box below. You will then receive an email every time a new comment is added. These will also contain a link to a page where you can stop the alerts, and remove all of your related data from the site. As a result when interning and at a new job I felt like a peacock and a fool! Whilst the suit is beautiful not suitable for working in, don’t make this mistake! Sweeney may be too outlandish..,. And don’t wear it with your OE tie to work! Goes down v badly ha, snort, guffaw! I have a very nice pair of dark grey flannels. What can I wear this with RE Jackets, Ive been too nervous to commit to dark trousers lighter jacket but if I do what colours should I look for? Pretty much all colours should work, as long as they are not as dark as the trousers. Green tweeds, for instance, tan or even navy. If they look like they might be similar in tone, mix them up with something else, such as green/burgundy cardigan with the navy jacket and grey flannels. From my personal experience emerging into the ‘real world’ after university, I seriously would recommend waiting until you settle into a new job & lifestyle before beginning to embark of a certain style and shelling out large sums of money. Reason being, depending on your job you will dress completely differently from other professions, there may be nuances which you aren’t aware of yet (& most people outside the profession aren’t aware of). In my case I went to work in the City, where different types of job role dress quite differently from one another i.e. an M&A guy dresses differently from a sales guy etc. Note, a lot of professions (media, tech, even some areas of banking industry) don’t even wear suits unless meeting a client instead encouraging smart casual dress. Secondly, your lifestyle will determine what is useful to you outside work. After leaving University you may not want to go to nightclubs for example, where more flamboyant clothing may be suitable, but instead want to do dinner parties, or perhaps go to the theatre/musicals where different dress would look better. At the end of the day you are at a state of flux in your life, you may end up somewhere entirely different to what you may imagine so don’t start making costly decisions at this point. Caveat is you (your family) have so much money that its irrelevant. Classic M&A man talking 🙂 You see we already disagree .. I’m in markets & think dark brown shoes are fine with a suit .. & we NEVER wear a tie (as we do PROPER work you see .. and a tie would just make us all sweaty .. also the old school traders probably don’t know how to tie one, so it would waste a lot of their mornings trying to work it out). If you posted your future intended occupation it wouldn’t be useful without also telling us region as people would dress differently in London from NY & HK in exactly the same job role. Also, to be perfectly honest with you dressing in bespoke suits may not endear you to your superiors (they may in fact resent you for it), dress smartly but humbly in banking these days I would say as most employees are not scions of aristocratic families who are going to commend you on your good taste. Agree with my fellow posters above – what is the job you are going in to? There really are some subtle differences which are worth knowing. Big fish/small pond to small fish big pond is a big transition, and you will want not only to dress well but correctly. So let us know where you are heading, but I think classic and conservative may be the way to go (or, in reality perhaps better is to spend the money on 2 or 3 solid made to measure suits and pairs of shoes at your stage rotation and variation will set you in better stead than one very high quality piece. Work and sweat batter fine suits anyway and are junior’s bread and butter. Thanks everyone, great to have first-hand recommendations for Sam. For the price of the bespoke we are discussing, Sam, you could also have three Graham Browne suits, for example (around £1000) each. Bespoke but not of the highest order. They will last well, particularly if in a decent worsted (nothing less than 11oz, preferably 13oz). Judging from the comments it’s such a shame that making an effort and dressing ones best is seen as a drawback in the world of work. I recall my late father and his friends who worked as a labourer in a foundry sporting a crisp white shirt , tie and dark suit at weekends . They did that one thing that we’ve lost through the generations …..they made an effort . Firstly, thank you Simon for taking the time to answer this question. I feel that the link between my future job and this suit is missing the point a little. A dark navy, classical suit I hope would be of use to me regardless of my career path. The same I’d hope for a dark brown pair of shoes. Similarly, and I admit others have more experience of this (Simon), I would hope that a restrained but well fitting suit would not cause resentment amongst others be it at work or anywhere else (I don’t plan on broadcasting how great I look). That said I take on board all these comments and appreciate people taking the time to advise. I agree with all the comments made by more experienced bespoke customers. Don’t rush into bespoke. Your first priority should be to own a rotation of say 5 suits minimum for a suited job (10 would be better), so for the price of one bespoke suit you could afford instead the entire rotation you need to get started in suited life. To m, that would be a better use of your money if you intend to be well-dressed everyday — one nice suit and one nice pair of shoes, no matter how bespoke, will start to look shabby if worn too often. Rotating is what makes you look sharp everyday. Also, jumping into bespoke before becoming very well-versed in RTW and MTM suits is a hazardous shortcut. Even experienced folks such as Simon or myself will get it wrong sometimes when commissioning from a bespoke tailor — and that is a very frustrating experience — because going bespoke is also about giving form to a personal vision, and it takes years of experience to mature that vision. Experiment, first find your personal style (at age 22 it is by no means set yet, mine is still in evolution 20 years later), and then move to bespoke when it’s the next logical step on your sartorial journey. Another way of looking at it (that I believe reflects the sentiment of the other commenters) is that developing your own style takes time and practice. It’s tempting to assume a tailor will always make your clothes amazing but, the reality is, a lot of the bespoke process requires a fair bit of understanding of how clothes fit you and how you tend to wear them. Obviously, a lot of this is determined by the dress codes and norms of your job but it also comes down your own personal style. Even something as generic as a navy blue two-piece can be transformed from a sober business suit to a more casual wedding ensemble to a fashionable evening outfit with quite subtle changes in material, buttons, lapel width, etc. This “design” piece of the equation is something Simon is particularly good at but then, as you can probably tell from the blog, he has devoted an extraordinary amount of time and effort to learning about all the details that go into good design. Given all this (and assuming your funds are not unlimited) it would seem prudent at this early stage in your sartorial career to spend your money on 2-3 MTM suits in different styles so you can learn more about what you really want from a bespoke tailor. I hope none of this sounds condescending; I’m fairly new to the world of bespoke tailoring myself and have definitely made a few missteps by jumping right into high end bespoke pieces, only to realize they are not quite right for my needs (such as a very heavy grey English flannel suit that is far too warm, for most days.) With hindsight it would have been much more efficient to experiment with cheaper MTM options, or decent RTW and a good alterations tailor. Would echo a lot of the sentiments above, unless you have a weird body shape (e.g. I have small shoulders and short arms), getting RTW is probably a easier way of entering the bespoke suiting market. Most decent shops will offer you adjustment services and can get very good suits for under 1k. Lots of MTM options in this price range too. It allows you to know what you want better and also gives you the capital flex to build up a good rotation (I would say 2-3 suits is fine to start off with, no need for 5). As for where you will be working, if you choose the City – black shoes only please and also keep the fabric plain (I remember people commenting on a houndstooth navy suit as too “flash” when I first joined). No need to draw undue attention with 3 pieces or DBs etc at the start of your career – and (in the City at least), the dress sense is still very conservative so don’t listen to people who tell you that brown etc. is OK.
One. I would suggest going for a cheaper tailor initially. Unless you get lucky then bespoke can be difficult, mistakes can be made, and even the best tailors can produce unsatisfactory results due to miscommunications or simple mistakes on the part of the bespeaker. My first commission was very disappointing for a number of reasons including the fact that for some reason I specified slanted pockets and subsequently decided I hated that look. I am so glad that I went to a cheaper tailor to make that and a few other mistakes (e.g. buttoning point too high). If you get it right first time then great, if not then you’ve wasted less money learning from your mistakes. In either case you then have a suit that you can wear when visiting a tailor that you really aspire to such as Sweeney or Powell. You will be able to communicate so much more to them and learn so much more about what they will be like to deal with if you have a first commission from someone else to discuss what you like and don’t like about it. Two. Don’t forget shirts. If you have a body shape that is a good fit for RTW then great but many people they can end up with huge billowing backs on their shirts which looks very unsightly. It can also be a cheaper way to get one’s first experience of the bespoke process if you can find a bespoke shirtmaker that doesn’t have a 4 or 6 shirt minimum initial order. Sean O’Flynn on Sackville Street and Richard Anderson on Savile Row are two that occur to me who don’t have a minimum order quantity. I’ve used Sean with mixed results, he made mistakes getting some of my details wrong on a few occasions but he does cut a good shirt and if you’re sticking to something quite simple like a white business shirt then you should have fewer opportunities for errors in the details. I hope some of that is of help. Good luck with building your wardrobe and with your career Sam. You mention the museum calf on the Lobb shoes-what exactly is museum calf? Is it the same as bookbinder leather? Why do you feel the museum calf looks artificial? It seems to be much admired on the Leather Soul (Hawaii) website. I would recommend the shop to anyone visiting Honolulu. Thanks for your answers to these questions. Another brilliant post Simon and also appreciate the helpful series of comments. Any thoughts on how much and which types of surface detail (herringbone, pin stripes, nail head etc.) would be best to incorporate when starting to build out a rotation of core grey and navy suits? I am a bit of a non-standard shape and so never been able to get a nicely fitting suit. I invested in my first MTM suit from Ede & Ravenscroft near the end of last year. Whilst its a better fit than RTW it is certainly not “perfect” – sleeves ride up much more than my other suites and the part between the lapel and shoulder has partially collapsed. Anyway, that aside, my point was going to be that this MTM suit is 13oz wool under the advice of the sales person due to me wearing out trousers fast. Its also very warm. So thinking a bit ahead Ive been thinking of what to get made for late spring/ summer. What weight of fabric is the norm? How much less durable is a lighter fabric going to be? I graduated about five years ago; here are my two cents. A sensible, well fitting suit in a conservative colour (navy)/muted pattern is invaluable and essential as a graduate taking on the world, whether you already have secured a job to realm into, anticipate having to face several interviews before getting a job or intend on being a man about town who will worry about employment later. If you have the money to go bespoke, then do so and enjoy it. A best you’ll have a suit to wear and treasure for years; at worst you’ll get it wrong (and/or realise how quickly a suit wears once you enter the world of work, particularly if you don’t have 5+ suits on rotation) and learn an expensive lesson at an early stage. I’ve done a mixture of RTW, MTM and bespoke (in that order) since graduating. I feel like I got more out of the bespoke process as a result, knowing how I wear suits on a daily basis. Ps, if you are going into law, don’t forget that you have between 1-2 years before even stepping foot in an office/chambers, given the duration of law school. Your body (and stylistic sensibility) may change a bit in that period. PPS, if you’re going into banking, I’d start MTM and spend the rest on a dozen decent ties. I graduated a couple of years ago and initially went big with a high-end bespoke grey two-piece. Discreet patterns, decent worsted, two button, a nice solid suit. Walking past Ede & Ravenscroft a day or two after the first fitting I saw a grey pin head two button suit that fitted me so well that I bought it even though I should have saved the money for other things. Whilst I love the bespoke suit (and recently had a second made), it turns out that the RTW one is what I actually wear to job interviews. It’s still an obviously good suit, but it miraculously makes me look *better* without looking *different*. My cherished ‘Huntsman’ cut makes me look good but in an ostentatious way that wouldn’t go down well when first starting out in a conservative career. As for shoes, brown is more versatile, but it might raise eyebrows. Black never will. Monty, if you don’t mind sharing information, where did you have the bespoke suit made? Its interesting the off the peg makes you look better. E&R suits are pretty good & decent bang for your buck .. got a couple myself although the cloth is wearing thin on one although it is several years old now. Although 10 years older than Sam, I had been contemplating my first bespoke suit (jumping feet first straight from RTW!). Following a lot of research on house styles and reviews, I contacted two tailors that drew me in the most (one on Savile Row) to see if I can make an appointment. I see it as fate that neither got back to me to confirm any dates / time! As much as I still would love one, I’ve reassessed my needs for a bespoke and think I need to invest on building a rotating wardrobe with five+ excellent RTW or MTM. This article and comments from everyone certainly helped me make this decision! Is there a London bespoke suit maker who does things like Cifonelli — cutting and tailoring/sewing all in-house, under the one roof? One thing that, in fact, turns me way off the whole London/SR experience is the way the construction and sewing work is so often farmed out to unknown (to the customer) piece workers who stitch for numerous different marques. I understand a suit from Cifonelli is the absolute height of luxury, but one only lives once. And that it is all in-house seems less dodgy to me. It seems that with any number of Savile Row or Sackville Street shops, one is getting work done by — potentially — the very same mix of hands but at varying prices and who knows what sort of mood and commitment behind it, depending on who is doing the ordering. Or is Cifonelli the only way to go? I already answered this question here? what fabrics would you reccomend if one is looking a bit more towards “satorial elegance” than “usability for the job”? In the next months i am also going to get my first bespoke suit done. There are only a few occasions throughout the year where i will wear a suit in a job environment (and i already have 3 RTW Suits that work realy well fort this situations). I will wear the bespoke suit way more often in social settings (opera, dinner etc.) I still want my first tailored suit to be navy, single breasted, and calssic cut. But i was thinking about a slightly more interesting fabric for a start. Thank you very much for the fast reply! I also want to let you know that your book on tailoring is terrific. I have been reading it (again and again) for weeks now. Hi Simon – great post as always. You’ve passed your enthusiasm for bespoke to me too! I’m shopping around for my first bespoke suit at present. I visited Rubinacci recently and asked to see some designs and material (as you have suggested elsewhere). The lady assisting me (I didn’t catch her full name but her surname is ‘Rubinacci’!) said that its a “nonsense” to go for such a heavy cloth i.e. between 11oz – 13oz and that 8oz is perfect and that the first bespoke suit is perfect in all respects (I recall an article suggesting that the first bespoke suit is perhaps not as perfect as the second and third since a working relationship develops over time between a tailor and client). She asked where I obtained this information from, and shrugged her shoulders. I’m more confused now then I was before entertaining lofty thoughts of bespoke. There’s no need to post this (unless you wish) but your advice would be hugely appreciated as always. Terrible customer service Rubinacci; A and S superb though. Hi Simon. Was just wondering what fabrics other than VBC you would recommend for a entry level, first time bespoke suit? I hope you like to consider the following comments. 1. It is always worth buying an extra pair of trousers which will hopefully double the life of the suit saving you money in the long run. It will cost you a few bob more but this will serve you well in the long run. 1)The blog inspired me to build my husbands capsule wardrobe. A legit wardrobe of quality suits, blazers, sports jackets and shoes. However I just moved to Singapore and have not figured out quality tailors which is why I am turning to ready to wear for the first few. So here is my question: a) Is there a preferential/definitive list/ranking of suit-retailers that you may have? Hackett , YSL, kingsman etc? I know this can be subjective but on an average what suits would err suit a 73kg, 6 foot man. B) what important details should I look for when buying a suit that has already been made. 2) what type of of wool is suitable for the tropics? Wool seems to have a numbering system … So does it affect the quality? Sorry about the number of questions. I am new to this and hence a little overwhelmed. When ordering a bespoke DB suit, where is the best location for a specific cell/smartphone pocket, so that the line of the coat is least affected? High on the chest or low in the skirt? I know both Italian and English tailors have their earned their reputation. However, since I live in neither, those options are a bit out of reach. That is to say; if i want more than one fitting i’ll have to visit more than one time. I do however live in the Netherlands, home of suit supply. Who offer full canvas suits at around E700,-. those aren’t really workhorse though, since they only come in 150s wool. there is however a tailor based in the Netherlands (http://www.newtailor.nl). my question is, would that be a good bet, or is a relative unknown tailor to much of a risk? Wow! I admire the valuable information on the bespoke suit you have been able to share us through this post. I would like to visit the post once more its valuable content. Thanks for such post and please keep it up. I am 5ft 4 and always struggle to find a suit that fits. I need a dark business suit that will be worn daily. In the past I have bought a few made to measure suits in Hong Kong because I have been passing through. I don’t plan to visit in the near future so need to source a firm locally. I work in London but live in Cardiff. Can you recommend a tailor, please? I would hope to spend under £1000. In HK I paid about £600. You will struggle to find a real bespoke tailor for under £1000 I’m afraid. You’re best bet is Graham Browne, which is a touch over, and then Whitcomb & Shaftesbury at more like £1600 and up. Oh, and as a general point you should avoid wearing a suit every day. Every other day at the most, to give it a chance to dry completely and for the fibres to regain shape. When you say dry Simon do you mean the fibres absorb moisture from the body? I unfortunately seem to sweat more than most which is an ot of an embarrassing problem and a close cut suit seems to make it worse. I’ve never understood when people talk about wools property to wick away sweat as there is a layer of interlining, canvass and then a lining inside (I usually opt for bemberg) which would also absorb sweat before it even gets to the wool. I realise your not a meterials scientist but could you shed any light on this please? Well, there are various layers between you and the cloth in different parts of the suit, yes, but the wool or other external material is still going to get wet if it’s in contact with those internal layers. Next month I’m traveling to London and my first Saville Row bespoke experience (Henry Poole.) I’ve done bespoke and MTM before, but never at such an august level. What advice can you offer before going in? Should I wear my best fitting suit so they see what I like and how I wear it? What decisions and choices should I consider before going? Thanks as always for your willingness to answer all our questions, and for your amazing responsiveness. No problem. There is a fair bit on the site about this – but it applies to all bespoke locations really, don’t feel intimidated by Poole! I commissioned my first bespoke suit with a tailor that has a physical presence (sales, cutters) in the West but production in Asia. When making my enquiries with the owner, I was told that the process would be 4 total fittings over 10-12 weeks (initial visit, first fitting 6 weeks later, a second fitting, and final/collection). Just had what I thought was supposed to be the first, basted, fitting and per the advice in your book, took this to be for the tailor more than for myself. However, at the end, the cutter said final suit would be ready for collection at next fitting. Is it typical for tailors to cut out a planned fitting? If they skip a fitting is there anything that cannot be undone/changed? Should I insist on the original fitting schedule, or better to wait for the final product and then adjust from there? If it makes any difference, I have only put down a deposit rather than full payment up front. It’s rare to skip a stage, yes, and some things won’t be possible to change, such as length. Any suggestions for building out a bespoke wardrobe? I am interested to commission my first bespoke suit before year end, and only have experience with MTM. I am looking for value, but with a reasonable budget around $3000 USD. I generally like English tailoring at the shoulders, but also appreciate some softer aspects . I work in an office and also comfortable dressing more formal outside of work. I live in the Washington DC area and would like to find a tailor who visits DC, or perhaps NYC. However, travel costs for several trips to NYC could influence the decision. Some tailors have mentioned willingness to visit the US for orders of multiple suits. Personally, I would prefer to order one/time to ensure I am comfortable with fit/appearance. Please let me know your thoughts, and if there are any other tailors I should consider. Of those, I’d probably recommend Whitcomb & Shaftesbury given your budget. They’ll deliver value for money, and as you like English tailoring, will suit your style. Thom Sweeney I’d also recommend, for a more contemporary style, but as you said a step more expensive. I wear more casual clothes most days, incl. work – but decided to have a two piece 13oz navy suit commissioned with W&S. Basically to be worn at formal occasions where a suit is in order. I probably won’t wear it more than 30-40x a year. A second pair of trousers costs around 500£ extra (about 25% of the total price of a two piece). I have read that having a second pair of trousers is recommended to prolong the life of a suit, but would from what point onwards (amount of wear) would you say it makes economic sense to pay for that extra pair of trousers – or does it always make sense to acquire that from the outset? I think you’ve got two children. I’m really curious as to your thoughts on buying them expensive clothes or bespoke. While they maybe still growing or don’t understand how to look after things properly if one of your kids wanted a bespoke suit for an event would you pay for that? No, definitely not – not until they stopped growing anyway. It would have no longevity. I grew up with “hand me downs”. I’m sorry you have to save for not only paying for their university but also for their graduation 👩‍🎓 outfit when they finish and have fully grown. Got a question I hope you don’t find distasteful. Bespoke suits in London are prepaid? Or what’s the common payment policy? In my experience it’s 50% when ordered and 50% upon delivery; hence the question. PS. For some reason I’m not allowed to comment on your posts from an iPhone. Have tried from a couple different devices. Just letting you know. Yes normally it’s 50% on ordering and then 50% on delivery or just before. Thanks for your reply. My question is consequence of my budget organization jajaja. And I was assuming since I would be ordering a Bespoke piece that would probably take longer, given the fact that I don’t live in London, that the ordinary payment terms would be different. Regarding the iPhone point: it no longer seems to be an issue. Yesterday I would click/tap on the “Add your comment” tab and nothing would display; thus, not allowing me to post a comment. However, today it doesn’t seem to be an issue.